TrailblazerGirl loves the outdoors, but sometimes it (or should I say, we?!) can get a little grimy. One solution to this is the Road Shower, a rack mounted pressurized solar shower. Constructed out of powder coated high quality aluminum, it attaches to most rack systems and holds about 5 gallons of water. On sunny days, the water in the shower heats up to 12-20 degrees per hour. You can easily add pressure to it by pumping it with a hand pump, a CO2 cartridge pump, a tire inflator or a compressor in order to spray a jet of water up to 60 feet. 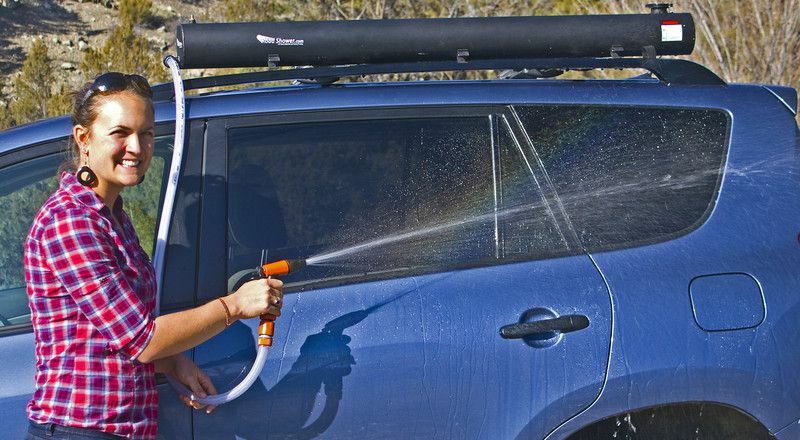 Not only can the Road Shower be used as a nice warm shower after a long hike, but it’s useful for cleaning off equipment, shoes, pets, dishes, etc. As they say, “it is like adding plumbing to your vehicle”!